Claims for Workplace Bullying have grown exponentially over the past few years. Worksafe Victoria alone saw around 6000 claims put forward in 2010 – 2011. Of those, only 10% were referred to the Bullying Response Unit. I’m not trying to belittle those who put forward the other 90% of claims, but a report that states reasons like “being dismissed after assaulting a manager, missing out on a pay rise or not being invited to a work party” as statements of claim does make you think about these ambit claims and the individuals making them. Don’t be fooled into thinking that this means we can allow our policies to lapse or take a back seat on the issue because many of these cases still have legs and can be referred to Fair work Australia or the Human rights equal opportunity commission for unfair treatment but it is not bullying per say. On the flip side, those that are actually bullied seem to be putting up with it. Too scared or embarrassed to say anything, bullied employees are resigned to doing nothing. Other than well publicized cases like the one involving Brodie Panlock, you don’t hear of many ‘wins’ in this area. Does that act as a deterrent to those worried about coming forward as a victim? As a society we judge people and their behaviors especially if we are an employer without thinking about the implications to that individual, some claims are simply ridiculous but some are genuine, how do we distinguish between them. People often accept this bullying behavior because of the anticipated backlash from these very same critics, their friends, colleagues and what society may think of them, this in itself perpetuates the issue of bullying as the bully gets away with it, sometimes even unaware of the impact of their behavior. 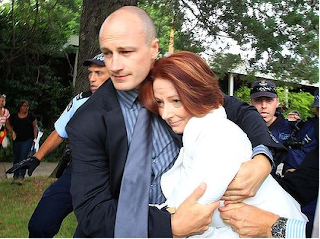 I was appalled to see Julia Gillard on Australia Day in the “shoe” debacle, and that is just the tip of the iceberg in a string of activities that anyone else would class as Workplace bullying. As the constant recipient of harassment and malicious comments, every day Gillard shows up to work she is thrown negativity directed at her by her opposition and MPs. The tall poppy syndrome is very prevalent in Australia particularly with politicians, ever been to a sporting event and heard the crowd heckle the Prime minister, every time I saw John Howard present at a major sporting event he was heckled and he laughed it off and waited for the crowd to subside before continuing, Is this bullying? Both he and Gillard held the top office in the country and will obviously always have critics regardless of their policies but by tolerating this behavior as the leaders of our country what message are they sending to other victims of bullying in the workplace? Is this setting a precedent that it’s just par for the course? According to the Government of SA, bullying can include: Abusive, insulting or offensive language; Behaviour or language that frightens, humiliates, belittles or degrades, including criticism that is delivered with yelling and screaming; Teasing or regularly making someone the brunt of practical jokes. If I’m not mistaken, Gillard is victim to this everyday. Subscribe to this by using the 'Follow by Email' tool on the top right of this page. Keep up to date with John Caldwell's views on the retail market.